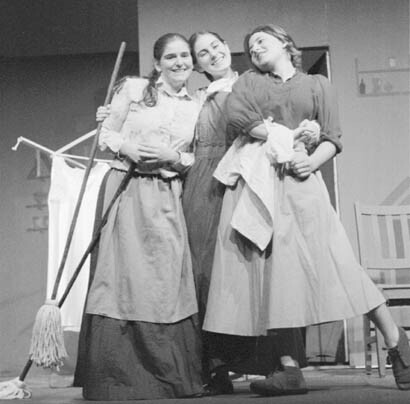 Three of Tevye's five daughters (Amy Katz '02, Sara Jo Elice '01, and Sherri E. T. Davidoff '02) sing dreams of their futures as they do the chores. The Musical Theatre Guild's production of Joseph Stein's Fiddler on the Roof provides an enjoyable evening, even if at times the events on stage don't really spring to life and the focus is misguided. 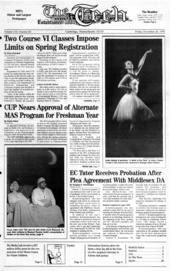 The original production of Fiddler occurred under the watchful eye of famed choreographer and director Jerome Robbins in New York during the 1960s. The plot draws out themes of change and progress.Set in Anatevka, a Russian village, on the eve of the revolution, the show places the overall change of Russia in balance with the change of "tradition" within individual towns and families. Conflict erupts in Anatevka when the first daughter of Tevye, a milkman, decides that she'd rather marry Motel, a tailer, than Lazar Wolf, a butcher who was selected by Yente, the town's matchmaker. Tevye is forced to place his view of tradition in balance with his daughter's well being, and the predictable outcome ensues. In one scene, as men and women dance together for the first time (the horror! ), there is a strong sense that things will not be the same again in this quiet village. The second act is paced much faster, with two more very quick marriages and the encroachment of the Russian government on the daily lives of the Jews. It's in this act that the play seems to become rushed, even though it times in at two and a half hours. What is missing from MTG's production of Fiddler is its grasp of the larger scale of events. The conflict between the Jews and Russians is forced and unemotional; unfortunate, since a little more development in this area by director Seth Bisen-Hersh '01, who decided to emphasize the play's humor, could have made the performance much more meaningful. The casting is very good for most parts. Jake Yara '93 (Tevya) provides the strongest performance of the night; it is worth seeing the production merely to see his extraordinary grasp of the role. Breaking frequently into pensive soliloquies where he questions the traditions of his native Anatevka, Yara pulls the show along, providing the most emotional performance. Others, such as Sara Jo Elice '01 (Tzeitel, Tevya's first daughter), and Dana Spiegel '99 (Motel, the tailor) also provide high quality performances. David Lung (Mendel) provides a lot of humor as he corrects Tevya's misuse of the "Good Book." Leah Schmelzer '02 (Yente) almost seems like a modern New Yorker and provides the most humorous part in the show - though the character also provides the strongest voice for tradition during the second act. Unfortunately, some of the most important parts are rather unemotional. Daniel Bedard '02 (Perchik) reads his lines strongly, but at times that's all he's doing, and on emotion alone he would fail to win the townspeople over in real life. The dance movements in MTG's performance were completely redrawn from Robbins by Dan Ben-Dror Marshall. Some of the dancing is very strong; some is very overdone and almost too dramatic. Of particular note, however, is the dancing by Daniel P. Gonzalez '02, Santiago Rivas '99, and Jeremy Zucker, who all do an excellent job at portraying the differences between the Jews and the Russians in dance. Perhaps the most depressing performance is by the Fiddler (Erica Peterson '02), whose actions are more symbolic than anything. The role is a hard one to play, since it has no speaking lines, but is emotionally supposed to show the state of the town. It's even harder when the height limitations in Sala force the "roof" to be only about three feet up over the main state. While the Fiddler performed excellently on her solos, at other times she attempted to fake playing with the orchestra. This failed miserably. The technical aspects of the play were excellent. Lighting, designed by Chris Lyon '02, was particularly strong in highlighting Tevya's soliloquies. Costuming, by Anna M. Galea G, effectively noted the time period and the differences between the Jews and the Russians, perhaps overstating it in a few cases. The set, designed by Elissa Schwartzfarb '02, was simple yet complex, and readily rearranged itself to suit the show's needs, but allowed backstage sound to leak in. And the cast could actually be heard over the orchestra, conducted by Jason W. Krug, a rarity for recent shows in Sala. MTG's performance is definitely worth seeing; overall it's a pretty strong performance of the musical. While some parts could use a bit more tuning up, overall the performance moves along and highlights some very talented actors and actresses.